Many would not have known, but Sinpopo is actually by the same group of people behind Awfully Chocolate! 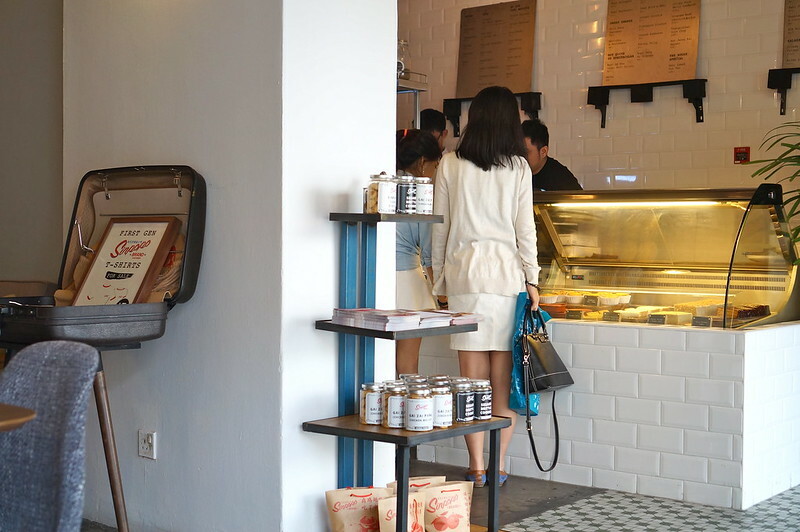 They seem to take root at Katong with Ninethirty by Awfully Chocolate just a stone’s throw away from Sinpopo and their HQ down the same road. 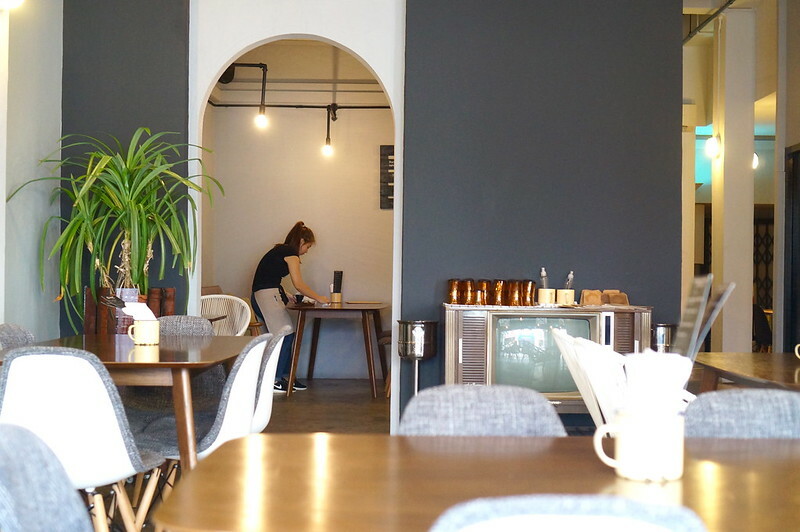 Taking the old-school, vintage route, the interior is reminiscent of the 80’s and oldies were playing from the sound systems – something that pleased my mum as she was happily humming to them. 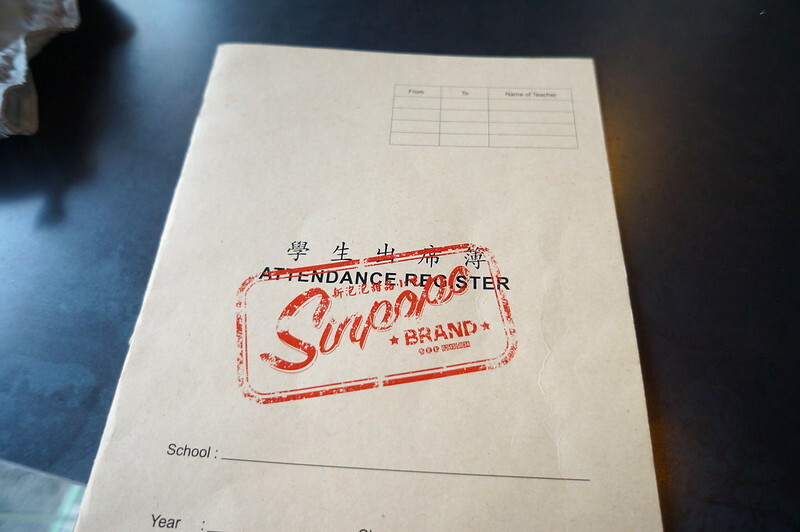 Looking at their menu, memories drifted a decade back to when attendance-taking used to be in the form of a thick book of excel-sheets-look-alike. The signature display of Awfully Chocolate goodies. That old black-and-white TV served to be of good use now too. Har Cheong Kai Wings ($6) – The real deal doesn’t come in fake reddish colours. Not only are these wings affordable, they were extremely delicious too! 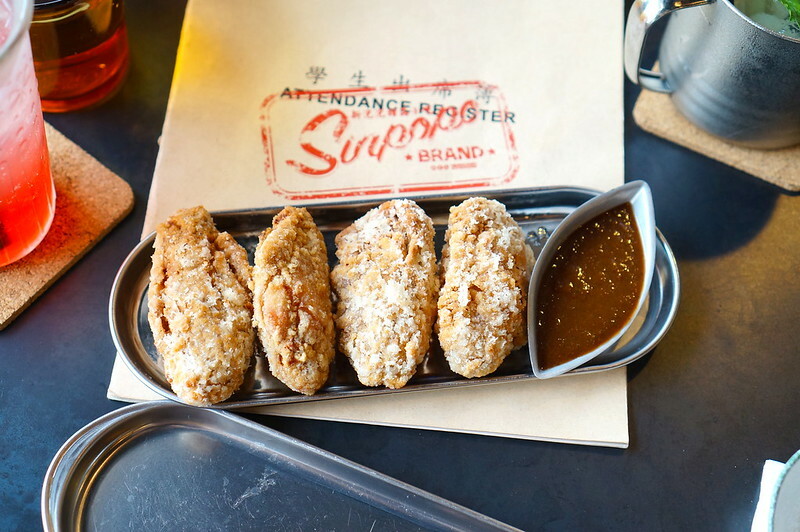 Crispy to boot, they seem to be coated with a light tempura batter too. The sauce that came with them balances the saltiness of the wings with some sweetness. I had to resist hard from ordering a second portion. 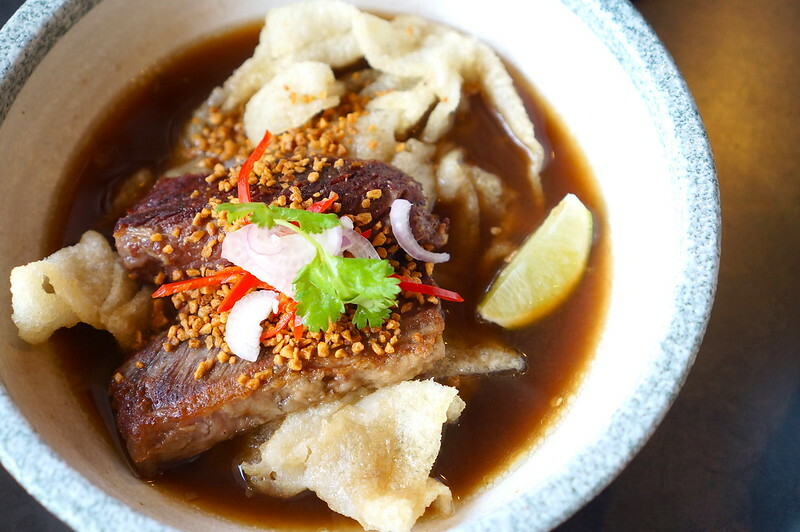 Sinpopo Beef Shortrib Horfun ($16) – Look, someone has gotten their head around and tried deep-frying their horfun! This dish definitely took horfun to a whole new level, where horfun isn’t even horfun anymore. If you’re curious of how it tastes like, you surely have to come down to have it yourself! But let me just say that it tasted a little like muahchee in terms of texture. According to the server, the short ribs had been braised for hours, hence its incredible tenderness. 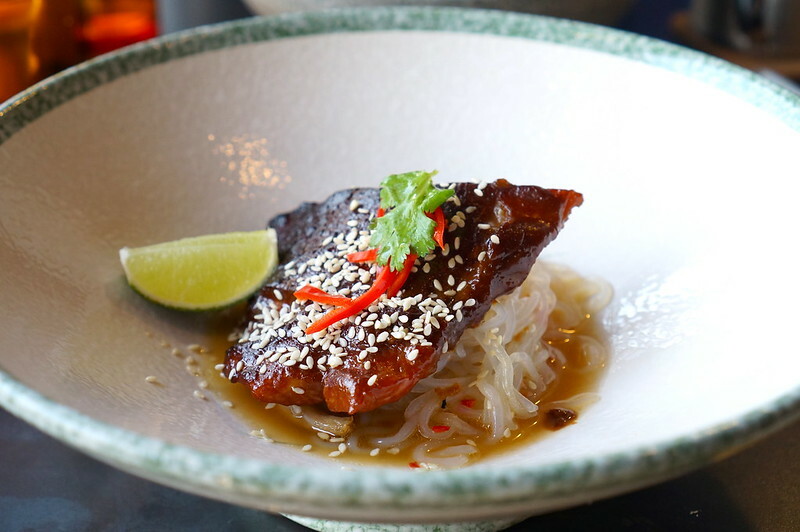 Baked Salmon ($16) – The salmon is coated with daojio or fermented bean paste, baked till pinkish in the middle and served on a bed of glass noodles and an acidic dressing. In general, this is not a hot dish that you’ll be expecting. Also, as it’s on the salty side, do request for less daojio paste on your fish! 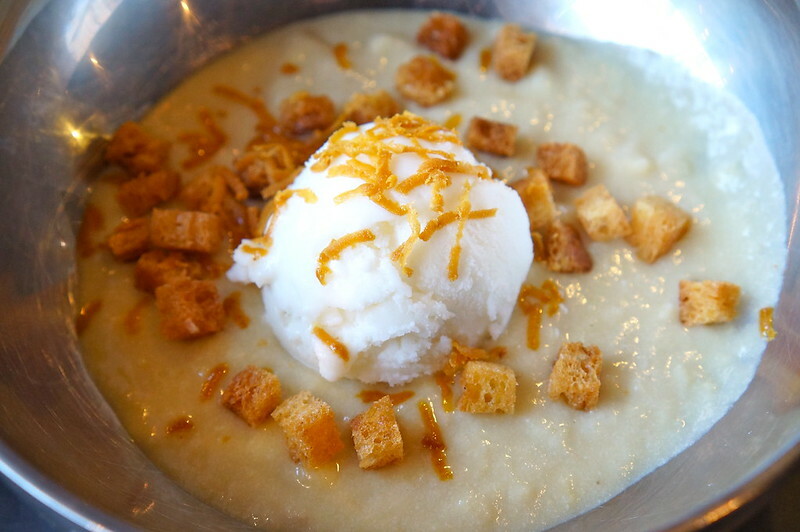 Durian Pengat ($9) – Served with coconut ice cream, the fresh durian paste is a durian-lover’s dream. Smooth, chilled and pungent, this beats eating durians off your hands! Great pairing with the tropical frozen dessert too! Gula Melaka Cake ($7) – Highly recommended by my cousin, my purpose of coming to Sinpopo was to try out this legendary Gula Melaka cake. I don’t know if I’m getting old… but it was way too sweet for me. 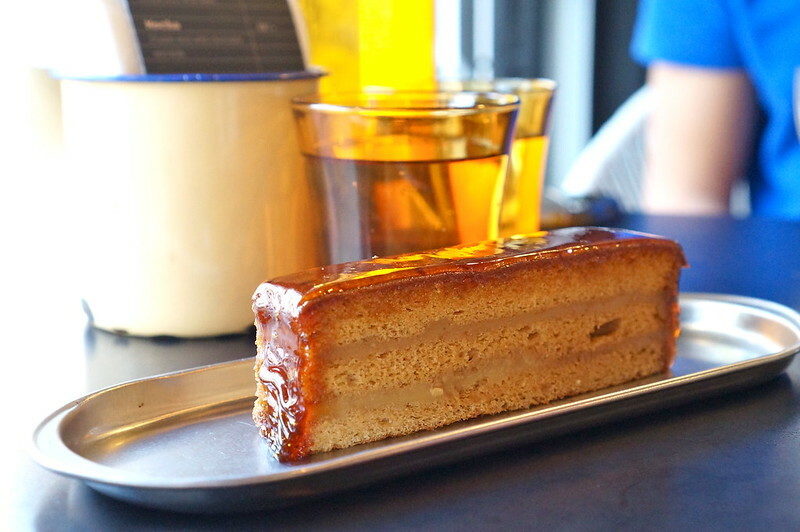 The sweetness came from the glaze itself, so if I remove it and eat the sponge and cream within, the hint of gula melaka and the softness of the cake was rather pleasurable. That said, I’ll opt for my durian pengat anytime over this! 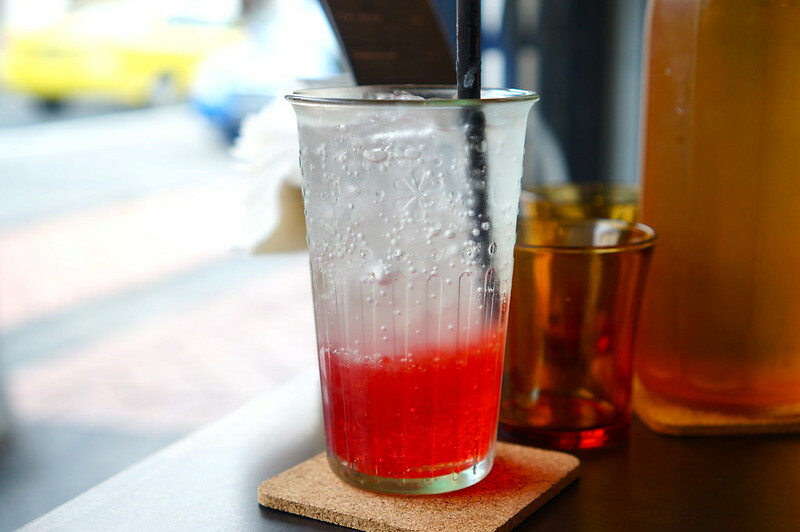 Katong Jelly ($7) – Of lemonade, agar agar and soda, this was loaded with sugar. 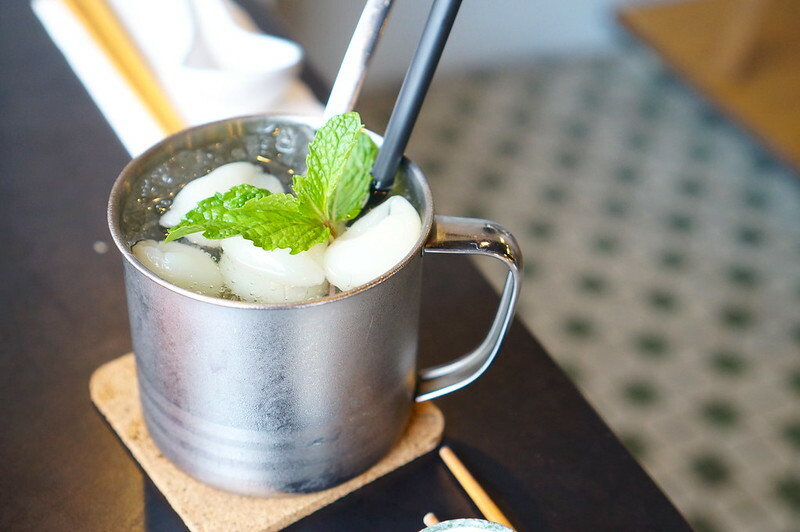 On my second visit, I tried their Sng Mui Pop drink where sour plum bits were frozen into cubes and dumped into soda water. I must say it was pretty fun eating the ice cubes. At Sinpopo, it’s really the Har Cheong Kar Wings and Durian Pengat that keep me coming back for more!